Hey there pussycat. Janet Beckers here with your Cool Cats video tip of the week. Today we’re having a look at another one of the big problems that I see that business owners make when they’re using video marketing, and this is the one that means that you’re either top of line and continually building up trust, or you’re one of those businesses were people go, “I remember there’s somebody that does that solution. I can’t quite remember who it was.” Let’s have a look at how this happens and what the solution is. One of the biggest things that I see as a problem is inconsistency. Business owners put out videos … They might put out one or two, and then they’ll be a really long stretch before they’ll put anymore videos out. They’re not building up a consistent way of communicating, and building a connection and trust with their clients. The big thing that I find that people say to me is, “Look, I don’t have the time to be making videos like that all the time. How do you do it?” I’ve been doing a weekly video to my database for over four years. People say to me, “I haven’t got the time. I haven’t got the resources. I haven’t got the money. I don’t know how you do it.” I’ll tell you what, it doesn’t take me that long. 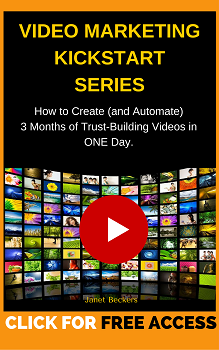 Every three months, the total of creating videos, leveraging them so they go out all around the internet is no more than a day in total. Over three months. The actual shooting of the videos for that may only take an hour or so. It’s not a long time. That’s the secret. It’s batching your time. In our online academy, the Cool Cats video, we have five different video strategies that we teach people, and one of those is the Me TV model. This is the model that means that you’re consistently in touch with people. This is a model that has launched people’s businesses. It’s incredibly simple but very, very powerful, and it all comes down to being consistent. Now, let’s look at a subliminal message that comes from this. When you are, every single week, consistently delivering a gift of knowledge to your clients, either in their email inbox or through their social media streams, as well as you’re connecting, you’re also sending that subliminal message of, “I won’t let you down. I’m reliable. I am here all the time.” That’s a really powerful message to be sending to people isn’t it? That’s another way that just is a really powerful way. Consistency is really going to end up creating a lot more traction, a lot more success and business and money in your business. For you, I’d love to hear, is this consistency of production, has this been a problem for you? What do you do to get around that? Do you batch your time, and your energy, and your focus? It’s a very effective way of being able to work. Please, leave your comments down below. I’d love to hear them. If you’d like some help to be able to implement video marketing strategically in your business, the best way to start is with the video leverage checklist. It’s a free gift for you. Links are down below, and it will really show you when you create a video, how do you really leverage it? 33 different ways I’ve got to show you that can happen really, really simply. Great, so I’d love to hear from you. Comment down below and I’ll come and join you. Bye.